Tehuacán-Cuicatlán Valley: originary habitat of Mesoamerica is a semi-arid area recognized for its remarkable level of biological diversity and precolonial water management system. The site consists of 3 component areas in the states of Puebla and Oaxaca. Botanically it is of special significance for its cacti, but for agaves, yuccas, bromeliads, bursera and oaks. The diverse fauna includes threatened amphibian and bird species. This will be an "easy" place to know if you're planning travel to Mexico and visit several World Heritage sites: site is halfway between Mexico City and Oaxaca. Now, not everything is as simple as you think. If you’re travelling from Mexico City to Oaxaca, passing through the city of Tehuacan, a classic route is take Highway-135 D (Cuacnopala-Oaxaca) until arriving Oaxaca; you will surely see beautiful landscapes and a small portion of the reserve, but you will not cross the heart. So, starting today, recommend take the difficult local Highway-980 (Tehuacan-Coxcatlan-Teotitlan-Cuicatlan-Oaxaca). Of course, the difference in hours from the city of Tehuacan to Oaxaca, on this local road, is 3 or 4 hours more; so once you're going back to Mexico City, you could take the "fast route". As a Mexican I can tell this is probably one of the most beautiful and interesting biosphere reserves around the country, and probably after Montes Azules and Zoque Jungle, the place that struck me most in the country, (well, I don't know Calakmul yet), anyway, can be very confusing if you don't bring an adequate travel plan. The place doesn't shine because of its infrastructure, promotion or knowledge throughout the country, which I believe has allowed it to be kept in a genuine and authentic way. There are no defined routes in its nearly 500,000 ha, and there are too many places to see. I will focus on those I have visited, and are within the core area considered to be a World Heritage Site (145,000 ha.). Last time I went (as part of my travel plan with 2 friends from Taiwan, for 2 weeks in Mexico), we first drive the road from Tehuacan to Zapotitlan. Just a couple of kilometers before reaching this village you will find the Botanical Garden "Helia Bravo Hollis", a communal botanical area that brings together a collection of almost all plants in the reserve through open fields. 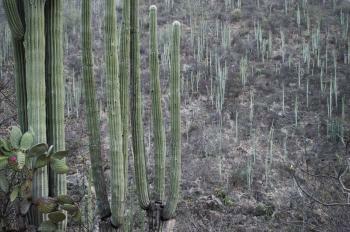 The place is mesmerizing, and boasts more than 50 species of large cacti. The main protagonists are the columnar cactaceae, some of which date back more than 1000 years and reach 20 meters and more. What particularly surprised me is the density (1800 ind / ha), just a look to the mountains and realize that, even if is a desert, in the strict sense could be called forest . The tours are very educational and cheap, but I don't know if are also in english. What is a fact is you will get a great effort from the locals to teach you everything about herbage, cactus and thousands of medicinal uses of plants (this is the best place to learn about something that should be intangible heritage of Mexico, its traditional medicine) (and sometimes they get 90 tourists a week, so the deal is very personalized). From this garden we depart back to Tehuacan, to take the local Highway-980 towards Santa María Tecomavaca. The path itself is a real gem. Special attention to the landscapes and the view of "salterns" in the sides of the road. Although I suppose there are no periodic tours within the salterns, are very visible from the road. From the outside they look like authentic pre-hispanic sites (and indeed they are). These small local salt flats continue in function until today. The largest concentration of this landscape is probably in Zapotitlan; these salt-flats are composed by a small white salt desert, caves and wells, which have extracted salt from the subsoil for fifteen centuries (this salt is highly valued nationally as gourmet salt). After seeing these landscapes, I am clear the inclusion of the place as a CL. I will pause to mention that along this road is the town of Coxcatlan, where is the "Purrón dam", the first dam created by the man in Americas (what explains why in these sites of Oaxaca could be tame maize) (anyway, we overlook it, but now I read is one of the 3 core zones). Why travel to Tecomavaca? Well, near to this town is the "Sabino Canyon", a deep canyon where lives the second largest population of guacayamas in the world (in this case Ara militaris). There is some signs to get into the canyon, but the best way to visit it, is ask to any person of the village for the canyon. All are trained to send you with local guides (maybe you have to walk one or two streets, and the guide, who also is father or farmer will stop doing their activities to show you the canyon) (in this part of the country people live in a kind of communal economy). They are kind and safe people. All. Sabino Canyon is a beautiful site. To get there, we walked over an hour from the village, through beautiful trails of cactus and shrubs. Maybe the best time to see macaws around the world is in the evening, when they return to their caves, and can be seen more clearly. I have no words to describe this incredible place. You can ask about the village cabins, as we did, and camp one night. The services are basic but not bad, and there is no luxury, but it's part of a true experience, in an authentic primal cultural landscape. We decided with proper care, made a campfire to talk at night. The sounds of nocturnal mammals are common. Next day we went to the city of Oaxaca, to continue our trip but maybe you can stay 3 or 4 days knowing this biosphere-reserve. I have gone to Tehuacan-Cuicatlan more times, is very large, and it's important that you review your needs. I have not been able to go to San Juan Raya yet, a village on the northwest side where people have developed a paleontological ecotourism program. A friend says anywhere you stop in town, you are walking on shells, mollusks and snails from the Cretaceous. Formerly a sea, now the marine gastropod fossils have been left in the open due to the lack of rain. San Juan Raya, despite being a town of 2000 people, has been the scene of many mexican films. So could be "the definitive town of the rural mexican popular imaginary" (look on Youtube for the movie "La Ley de Herodes"). This TWHS is not a commercial tourist place, like all those already now in Mexico. But as soon you're there, you can see why it's one of the most important biodiversity hotspots around the country. All activities are developed by small communities, genuinely concerned about preserving the area. Maybe the best example that I know of sustainable management and use of resources in an organized way. Certainly, a great contender this year, a true definition of mixed heritage. Article on the Water Control Systems of the Tehuacan Valley. Miocene: "Palynological assemblages from the Tehuacán Formation (TF), geochronologically dated as Middle Miocene (15.6 ± 0.4 Ma), provide evidence of a highly diverse flora that, at the generic level, is similar to the extant flora in the Tehuacán Valley. We propose that, during Miocene times, plant communities may have been formed of similar botanical elements to those seen today in the region, with some taxa adapted to semiarid conditions." 15 Community Members have visited.